I had the pleasure of taking photos and designing an announcement for this new little bundle of joy. 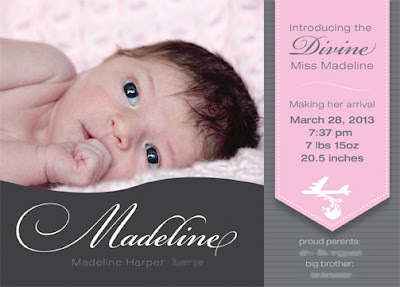 Because her name is pronounced Mad-e-LINE, not Mad-e-LYNN I figured a DIVINE announcement would suit her. And since mommy is a B-52 pilot at the Minot Air Force Base, the "stork" was changed just a bit! Talk about dropping a special delivery! Personalized baby announcements are always so fun to design! !